Here’s an interactive exercise to try. Take a look at the diagram. You will recognise that it is a checkerboard pattern with severe pincushion distortion, like the lens test result for a very cheap wide-angle. Underneath it is a line ‘A’; to see something intriguing, that is the distance at which you should view the image. It’s a proportion, not a fixed measurement, so you just apply the measurement as it appears on your monitor…so you’re in very close, yes? Keep your eye targeted on that centre white square, even if you cannot get it in focus. Now pay attention to, but don’t actually look at, the periphery of your vision. Do you see straight vertical checker patterns or are they still bent? How we perceive visual space has been contested since Euclid (c.300BC) conceptualised visual projective space as a sphere surrounding the viewer. The figure of a sphere represents human visual perception of space more accurately than Brunelleschi’s rectilinear construction for one reason; it accommodates the motion of the observer and the nature of the eye, itself a sphere, while ‘artificial perspective’ is constructed to fix space onto a flat picture plane. Leonardo da Vinci in the late 1400s, Aguilonius 1613; Abraham Bosse 1665; and John Herschel 1833, 1849 concur with the idea of the sphere of vision. Hermann von Helmholtz’ publication in 1910 formalised this notion out of his experiments like that at the top of the page. 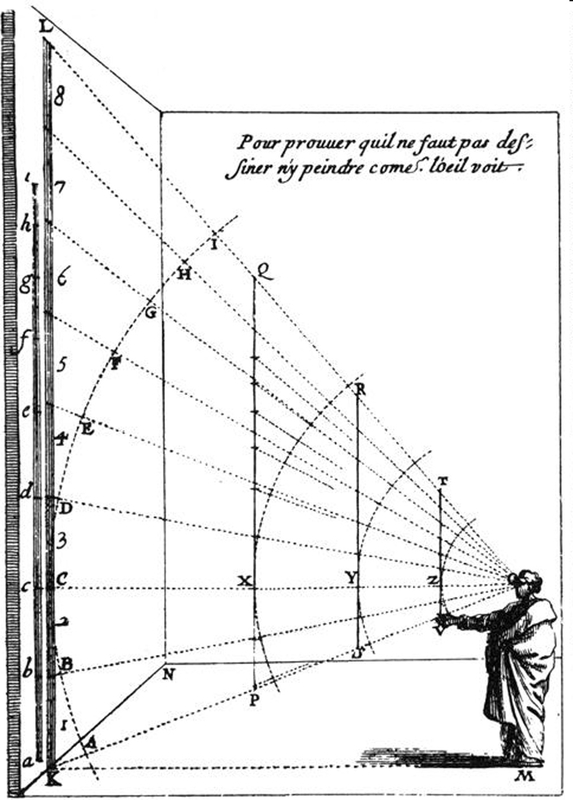 Abraham Bosse, in his 1665 illustration To prove that one can neither define nor paint as the eye sees demonstrates how the circular projection of the visual cone conflicts with the flat plane of the picture surface. This has given rise to debate since about whether straight lines in the world are perceived as straight or curved in a form of barrel distortion, and whether they should be depicted as straight in the picture plane of the artist’s canvas. Graphic artist M.C. Escher for example developed formal schemes for the definition of curved perspective, approximating the projective geometry of the extreme wide-angle or ‘fish-eye’ lens. 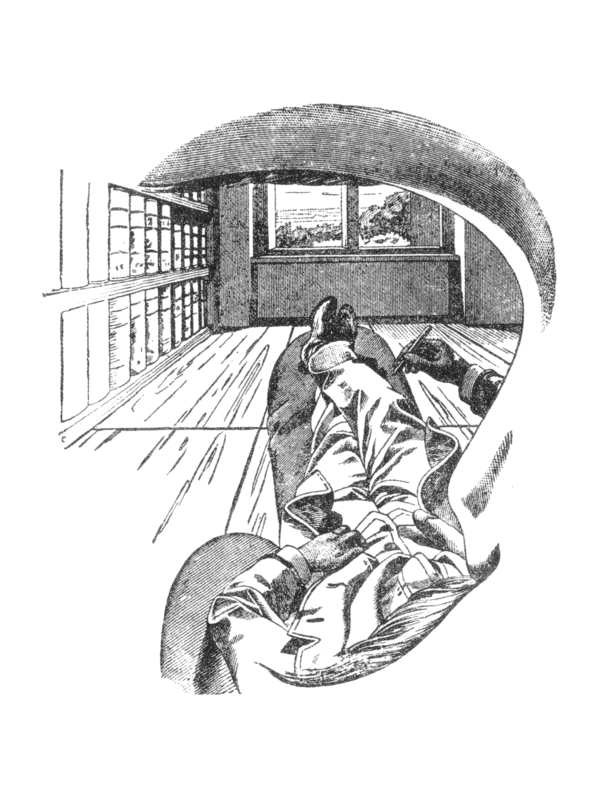 Ernst Mach’s, Picturing the Visual Field, 1886 is a remarkable rendition of a consciousness of being in one’s head, looking out on the world which also contains us. It also resolves a problem for the photographer; how to generate the ‘first-person voice’ in our images. Numbers of photographers have contributed their own approach. One I admire is Ed van der Elsken who employed subjective cinematographic approaches in his 1960s films, such as interviewing from behind the camera and filming from the driver’s seat in hectic trips through the narrow streets of Amsterdam to the audible protest of his wife Gerda. He first practiced such a perspective in his photography, much appearing in his photobook Een liefdesgeschiedenis in Saint-Germain-des-Prés (Love on the Left Bank) and in experiments with first-person perspective from a low angle with a wide angle lens. 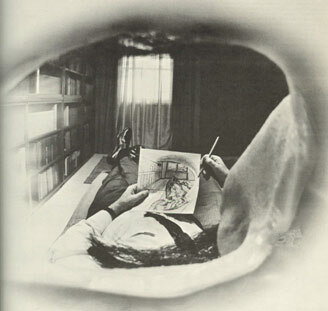 Le champ de l’oeil (Gibson, J.J. (1950) The perception of the visual world, Houghton Miffin. Look again at Mach’s illustration. How closely does it, or does it not resemble a fish-eye lens image? ￼Observe the verticals and horizontals at the edges of the drawing. Compare this with the verticals in a photographic rendition (from J.J. Gibson The perception of the visual world, Houghton Miffin, 1950) which seem to bend. The fisheye camera image on the other hand is all curves beyond the centre of the frame. Is this how we see the verticals of our environment? When standing in the tight space of a shower cubicle do I see the frame and edges of the glass walls as curving? Beyond that do I see the corners of the bathroom as bending outward in the same way as I know they will appear in an extreme wide-angle or fisheye photograph? After many observations, I am sure I don’t. If I pay close attention as I walk through a long narrow hallway I don’t find the verticals bending outwards like the extreme barrel distortion of the fisheye camera lens. Likewise, in Mach’s picture, the volumes on his bookshelf remain faithfully straight. But in accord with all we know of the artificial optics of the camera, they ought to appear curved. What is going on? 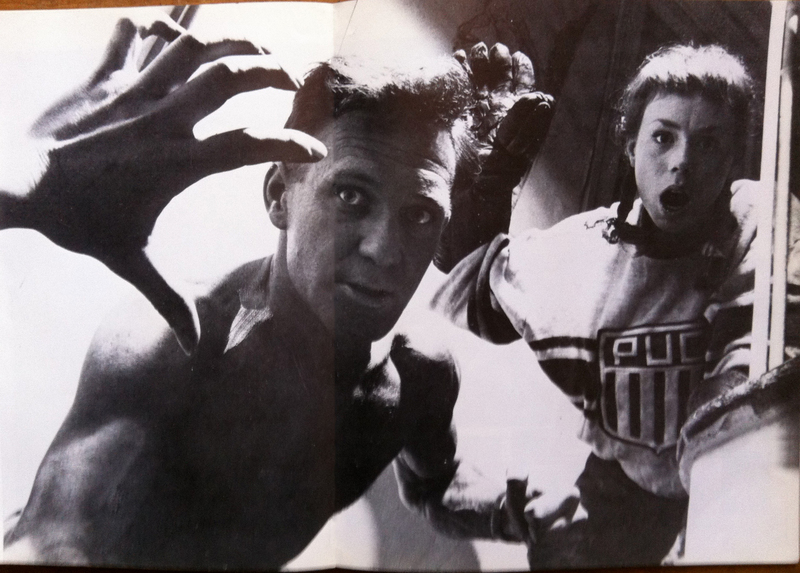 Is that what is happening with the famous ‘Winogrand Tilt’? The brilliant photographer prided himself on his reactions in capturing the street; he loved basketball and had his own camera moves: ‘You should see my turnaround jumper.’ Gary Winogrand‘s imagery exhibits virtuoso mastery of the peripheral. He favoured the wide-angle lens, a 28mm or even a 21mm, and in using it to make Hollywood Boulevard 1969, he spectacularly and shocking relocates The Judgement of Paris to Los Angeles where haloed Hera, Athena and Aphrodite tread the stars of now tawdry Hollywood Walk of Fame appraised now by a very mortal man in a wheelchair who sits in for the shepherd Trojan, Paris. Ideally, I wish I had a lens that took in my whole angle of vision, without mechanical distortion – that’s the headache with these things. Ideally, that would probably be the most interesting to work with. The 28 is probably where the mechanical distortion is least limiting – much less limiting than a 21. It’s closest to the angle of attention. It’s pretty close to at least my angle of attention [my italics]. Probably the 21 is more so, but its just extremely limiting. You have to use it very carefully. Helmholtz’s famous distorted chessboard pattern has been used here to make the point that perception of the straightness of peripherally viewed lines is not always veridical, Winogrand’s imagery I have referred to as an example of the relevance of this perceptual paradox to the photographer. 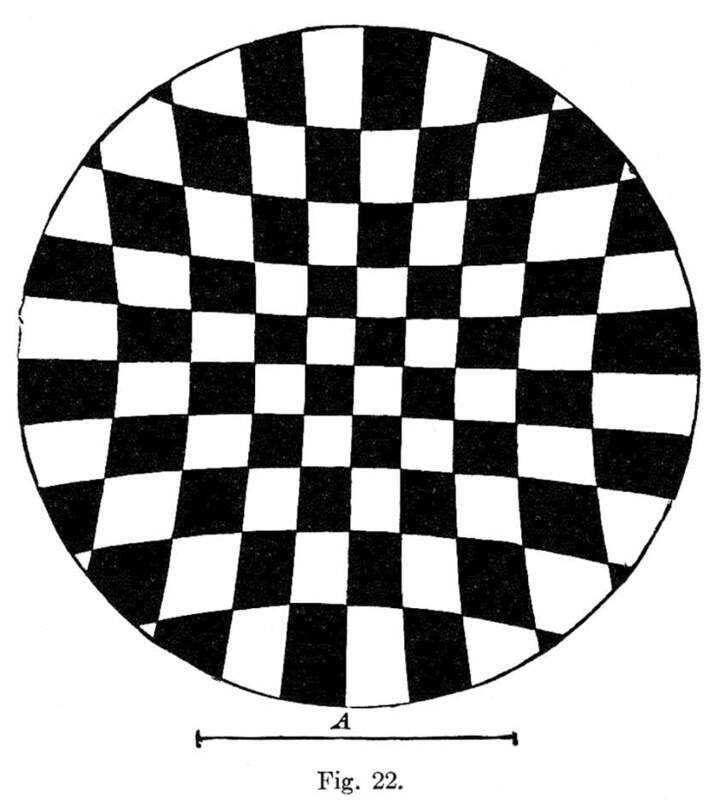 Helmholtz, by presenting the eye with curved lines of his chessboard pattern showed thay they appear to be straight when viewed from a critical distance. Brian Rogers & Cassandra Rogers 2009 paper Visual globes, celestial spheres, and the perception of straight and parallel lines [Perception, volume 38, pages 1295–1312] confirmed Helmholtz’s observation that the perception of peripherally viewed lines can be at odds with the real world. According to their experimentation, the misperception of contours in the Helmholtz figure is a result of the lack of 3-D information in peripheral vision and the use of a regular texture like the chessboard pattern. Much more subtle things are happening because of the adjustments our brains make to the data from our eyes from the three-dimensional world. An exciting development in the research and development of prosthetic eyes took place when Professor John Rogers at the University of Illinois in Champaign produced a camera with a curved light-sensitive surface like the human eye’s hemispherical retina (according to the study published in the journal Nature). Where complex lens construction is needed in a conventional camera to reduce edge distortion in order to cohesively render an image on a flat surface, this curved light-sensitive surface permits the use of a simpler lens for a much broader field of view, more uniform illumination and fewer aberrations. 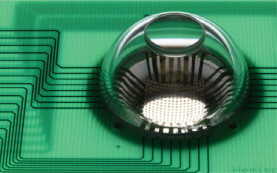 “We can now, for the first time, move device design beyond the flatland constraints of conventional wafer-based systems,” said Professor Rogers.The light detectors of the device are standard sensors mounted on a layered material that can be flexed into a curved, hemispherical shape without putting stress on the detectors. “If you simply bend it, those materials are brittle like a ceramic bowl. They break,” said collaborator on the project Professor Yonggang Huang of Northwestern University in Evanston, Illinois.An international team, led by Monash University, says the bionic eye is ready for human trials. “We have made significant progress since beginning last year and are confident we will have a device that could treat the majority of patients who are clinically blind,” said team leader Prof Arthur Lowery. New possibilities for advanced camera design will be a spinoff from such artificial retinas. It will be intriguing to see images produced by this once the technology is sufficiently advanced to curve the photo-sensitive to cover a proportion of the sphere equal to that which the retina occupies in the human eye. It may also help us to better comprehend human vision and the puzzle of peripheral perception; do we see straight lines? 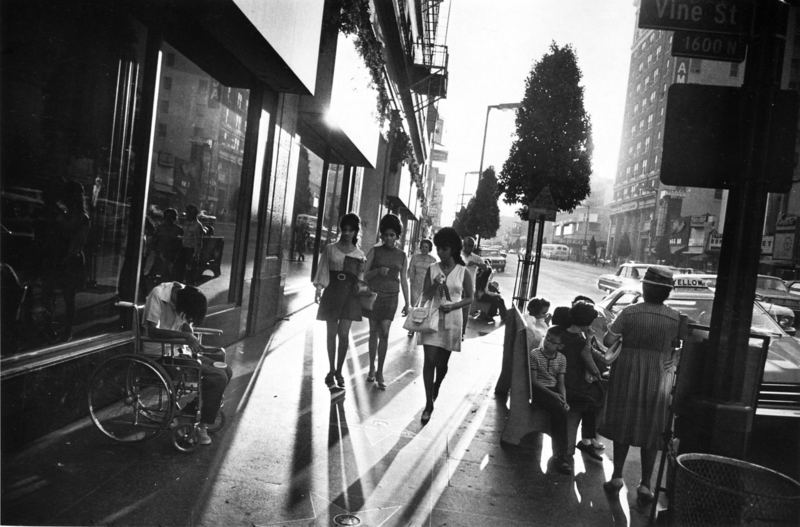 *The first retrospective in 25 years of work by artist Garry Winogrand (1928–1984)—the renowned photographer of New York City and of American life from the 1950s through the early 1980s—will debut at the San Francisco Museum of Modern Art (SFMOMA) from March 9 through June 2, 2013. In loving memory of Mary Ellen Mark (1940-2015).